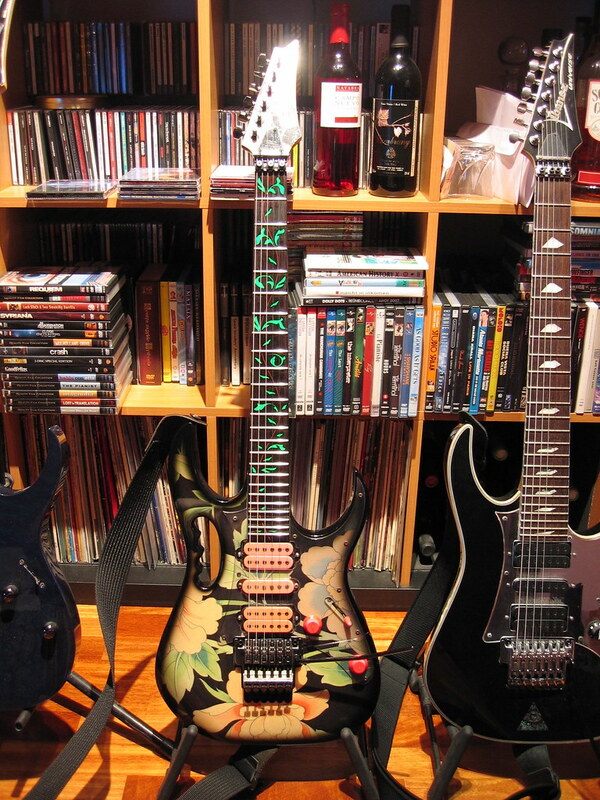 Jemsite > Guitars and Gear > Ibanez JEM, UV, JS & Other Signature Models > Got my first Jem today! '88 or '89 Jem77FP! Got my first Jem today! '88 or '89 Jem77FP! Today I finally bought my first Jem, an '88 or '89 floral pattern. And very nice it is too. Pics will follow as soon as the battery of my camera is charged. 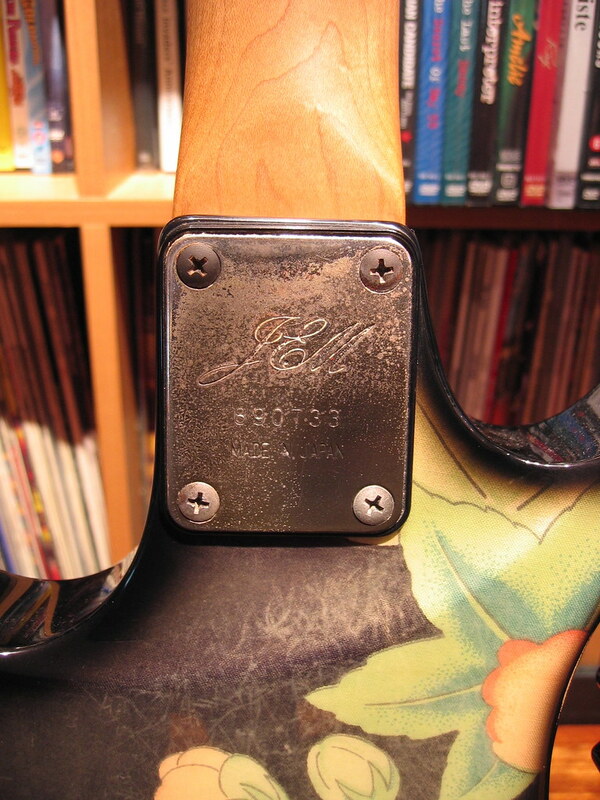 The serial number on the neck plate is 890733, would that make it an '88 (like with the early F x xxxxx number on the headstock where the just the first digit denotes the year) or an '89? There is no serial number on the headstock by the way. It is very used, with some small chips and dings, lots of finish wear to the cosmo parts, and of course a neck pocket crack and a well-worn neck plate. The back of the neck has also been colored with age, and for some reason you can feel the scarf joint (like a small ridge, hopefully this is nothing to worry about?). The thing is, it has recently had its frets leveled, and it has been set up perfectly. The trem has never been used (which I think I can tell from the way the arm has no free play whatsoever) and returns to pitch perfectly every time from all the way up or all the way down. One odd thing is the vine inlays. I thought they were supposed to be opaque green plastic, but on this guitar they are clear plastic, with the green surface set somewhat into the neck. Is this normal? Anyway, that didn't stop me from taking it home with me. It looks amazing, and if anything the wear makes it look even better. Like I said, pictures will follow as soon as the camera is charged. Right now I am going to play with it a little more. Re: Got my first Jem today! '88 or '89 Jem77FP! There's no way that plate number is right. Uh oh, we need pictures but something seems fishy with that one mate. Agreed. A few things don't seem right. Thanks for your replies, I think. I have to say you got me a little worried. The lighting is not too good, not to mention rather yellow, but the number at least is visible. What exactly would be wrong with the serial number? Also, what else seems fishy? well judging from the pictures it clearly isn't a fake, i think the serial is usually located at the back of the headstock. congrats ! Plate is right. I'm going to need a few thousand more JEM plate numbers before I can figure that out, they were into the 4000 range by 1989.
from looks alone it's seems fine and there's nothing to say it hasn't had a plate swap with another guitar. Perhaps the original owner decided to change it when it first started to scratch and pit. My DY's plate is all pitted like that, but I think it adds character. Congrats! Sweet guitar you got there! Scared us there! Looks real to me! Congrats! That guitar is SO sick! call me mad but guitars like that need wear guitars like that are monsters, not monsters to be put away but monster to be unleashed and played! what is a good camcorder today?